Good morning everyone! 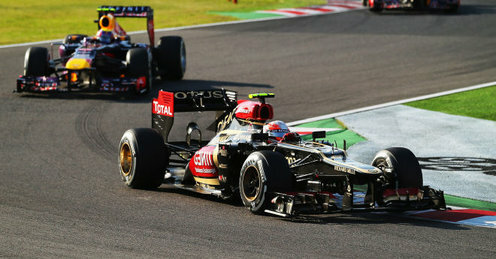 Well yesterday certainly provided the best entertainment I’ve seen on the F1 race track compared to the last few races. With beautiful blue skies in Suzuka, Webber and Vettel lined up at the front of the grid ready to charge to the first corner. The lights went out, and both Red Bulls had a pretty poor start, and it seemed like Hamilton would challenge them both for the lead of the race, when unfortunately the previous World Champion cut across Vettel and sliced his right rear tyre which caused a puncture, sending him back to the pits on lap 1, and ultimately deciding to retire the car shortly after. All the while with this action going down, Grosjean came flying down the inside of Vettel snatching the lead from both Red Bulls. Driver of the day goes to the Frenchman, with a stellar performance for the first 29 laps. It was unlucky that he lost out to Mark Webber during the closing stages of the race, but nevertheless P3 is a fantastic finish for the Lotus team, and possibly shows that he is ready to lead the team in 2014. Winners at Suzuka include Kimi Raikonnen, who was his usual gutsy self executing unbelievable overtaking moves, most notably overtaking Hulkenberg for P5, going round the outside on the penultimate lap – sheer brilliance! Vettel was another obvious winner, finishing yet another race in P1. However this was probably one of the more untidy races from the German, with him having big lock ups on more than one occasion, and visiting the grass area rather often. He ultimately had the best strategy, managing his tyres like only Seb can, causing him to stop one less time than teammate Mark Webber, which led him to cross the checkered flag first at Suzuka. Webber had a good drive too, and it seemed the Aussie was going to stay ahead of Vettel for once, but unfortunately an early pit stop forced him to have to adopt a 3 stop strategy, instead of the 2 stop that his teammate was on. Another missed opportunity for him to gain a farewell victory. Alonso performed well with the hand he was dealt for Sunday, finishing in P4 after qualifying rather poorly in P8. However with a 90 point lead for Vettel and only 100 points left up for grabs for the last 4 races, the chances are mighty slim that Fernando will steal the World Championship from the German. See you in 2 weeks in India!